Officer Nicholas Hoffman shares his traffic data with Lisa Kelly and other city council members. Although most officers deal with traffic violations and related issues in their day-to-day duties, the Fort Thomas Police Department now has a position dedicated exclusively to this issue. Officer Nicholas Hoffman has been selected to fill the newly created position of Traffic Officer. Concerned with the growing number of traffic-related complaints by Fort Thomas residents over the past year, City Administrator Ron Dill and Police Chief Mike Daly met to explore ideas and resources available to address the traffic issue and came up with the idea for the new position. After creating a description of the duties for the position, the chief invited interested officers to apply. The first duty of the traffic officer would be to gather data and provide feedback that could help determine if the position would be effective. "We were looking for someone who would be very proactive and performance driven in the position," said Daly. He added that he was very pleased to hire Hoffman, a five-year veteran of the department, for the new role. Located at 14 N. Fort Thomas Avenue. On duties for the new officer, Daly said, "One of the things we thought was important for that position, would be to run the radar on all the traffic complaints we receive on a daily basis. The officer would write traffic citations, state oral warnings, do drug interdiction and enforcement... they would check the traffic book every day to see what streets needed attention." Improved communications between the department and residents is another goal for the position. The new officer would respond to the complaints personally either by email or with an official letter of response. Hoffman started in his position in January and kept a detailed log of his daily activities for two months. He created monthly reports based on the data he’d collected and shared them with officials at the March city council meeting. "I'm thrilled to be here to talk a little bit about this assignment as traffic officer," said Hoffman. "We are very fortunate to have our city leaders recognize the issue and take action to create this position. I’ve been on this assignment for two-and-a-half months. I’ve been working closely with Mr. Dill and Chief Daly to help alleviate the traffic complaints." He explained the process when it comes to one of the most common issues —speeding. "When we receive a speeding complaint, we conduct a speed survey and analyze the results….After that happens, we utilize our speed trailer and target enforcement signs. Then we determine how to allocate our resources to develop key enforcement based on all these results." For Hoffman, the position is an opportunity for communication and education. When most people think of police and traffic reports, they think there will be more tickets, he said, but his goal and his department’s goal is the same as that of the city. He is looking for opportunities to educate the community and make it safer for everyone. In his first two months, he made some surprising discoveries. "In the month of January, I made 72 traffic stops, gave out 65 warnings and 26 state citation charges. In February, I made 64 stops, gave 54 warnings and had 53 state citations. In those two months, 136 traffic stops were made. What I will point out is that 73 of these stops were for Fort Thomas residents, so more than 50 percent of the time I am stopping a resident of Fort Thomas." If you take away the work he does on the state highways involving drug interdiction, the percentage of local residents is even greater, he said. The spike in February citations was directly due to drug interdiction on the highway and in serving of related warrants. Even after a short time on the job, Hoffman has discovered some issues that he would like to address with the community. "One issue I have noticed is rolling stops at stop signs," he says. In other cities, he’s seen temporary signs attached to stop signs that read "Complete stop free, rolling stop $145." “I think that gets the point across…I think this would be effective for our education process to promote traffic safety. We want to remind citizens improved traffic safety starts with them." 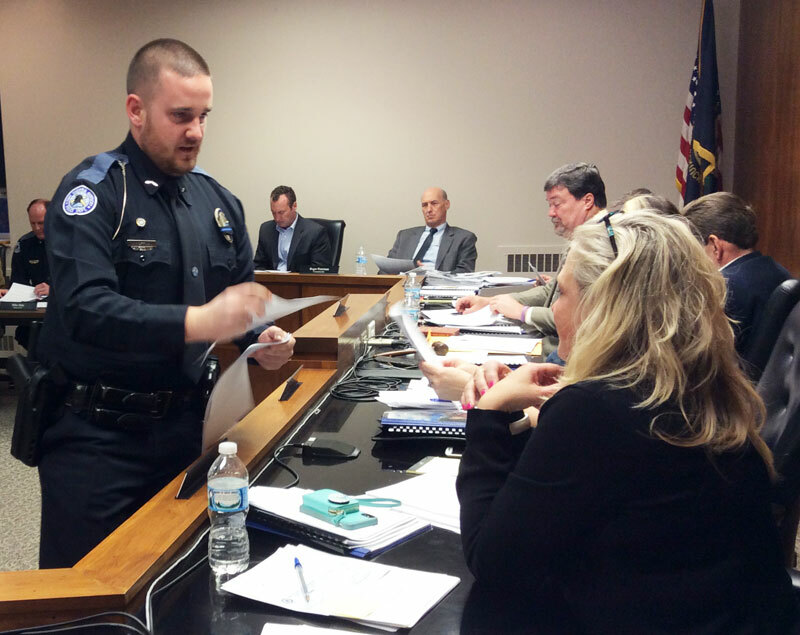 He thanked the city officials for the opportunity to serve in the new position and said he was excited to get to work making Fort Thomas a safer community. To make the department aware of a traffic issue, you can submit a complaint on the online form here, on the city's website. How do we request speed bumps or the in-ground reverse rumble strips NKU uses in parking lots? Our one-lane street has no sidewalks, one-side parking, blind curves, and is posted 15 (10 on the curves), though not very clearly posted. Residents are generally careful, but visitors and those who miss their turn on S. Ft. Thomas go too fast. Brentwood Place. Bravo! After lobbying the City for a solid year from Summer, 2000 into 2001 after a 10 year old fell prey to Vehicular Homicide in the cut-thru street Garrison, which is similar to my street at the time, West Southgate, it is gratifying to see the City / Police Department take this tangible step to practice risk management in order to protect the public, especially our children.